Terms and Conditions: Offer expires on 31/12/2013. 18+. New customers only. One free trial per person. Paid subscription starts automatically after free trial unless cancelled (and any discs returned). One package change, but no address change, allowed during trial. Not redeemable in conjunction with any other offer. One per household. All information correct at the time of print and subject to change or withdrawal by LOVEFiLM without notice. 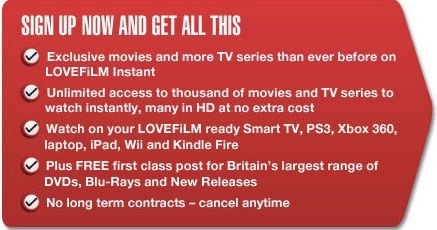 Full terms of Lovefilm service at lovefilm.com/terms. © 2013 Amazon, Inc. or its affiliates. Amazon account required, full terms available at Amazon.co.uk/terms. Content is streamed over internet. Titles vary by device. Excludes pay per view services. 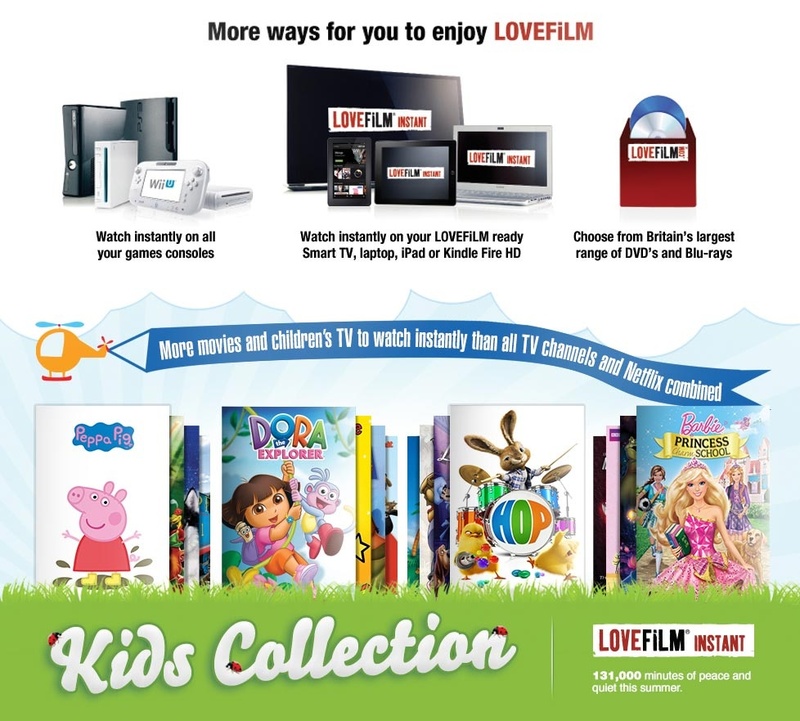 Based on the number of children’s TV episodes available currently on LOVEFiLM Instant versus Netflix and all terrestrial and multichannels excluding TV catch up services and pay as you go box office services, at any one time. Streaming on Xbox 360® requires Xbox 360® LIVE Gold. Exclusive titles not available on other UK subscription streaming service. Amazon EU Sarl, a company registered in Luxembourg, Registration Number B-101818, 5 Rue Plaetis, L-2338 Luxembourg. VAT Number LU 20260743. Amazon, the Amazon logo and Amazon.co.uk are registered trademarks of Amazon EU SARL or its affiliates. Want to watch something right now? © 2013 Amazon.com, Inc. or its affiliates.